Increase productivity by improving the office air quality. 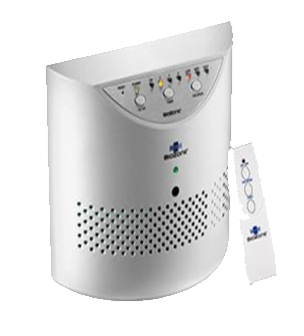 BioZone PR is a low allergy chemical free portable (or wall fitted) air and surface purifier that eliminates odours, mould and continuously inhibits the airborne and surface transmission of bacteria and viruses and other airborne impurities. Instead of masking odours and bacteria due to poor air quality from unclean air conditioning ducting and stale air due to poor air circulation, this is the way to significantly improve the air quality of the workplace by dealing with the bacteria at its source. Increase productivity by reducing your company’s absenteeism. How does the BioZone PR equipment work? The BioZone PR equipment draws in air that passes through a cleaning chamber containing a Photoplasma / UV lamp. Freshly sanitised air is emitted continuously without creating secondary air pollution such as masking fragrance chemicals. UV lamp monitor indicates the UV lamp has reached its life expectancy of 8760 hours (1 year) of continuous operation. UV lamp is easily replaced. Plugs into a standard 240v power socket. You have the option to either rent or purchase the BioZone PR equipment. If you have contracted our team to provide the Washroom Deep Clean with Steam treatments, the option would be to rent the equipment. That way, the equipment is fully serviced by our Cleaning Technicians, and the Photoplasma / UV lamps are replaced after one year of continuous service as part of the service. Call us to improve the air quality of your office environment. Increase productivity by reducing your company’s absenteeism.